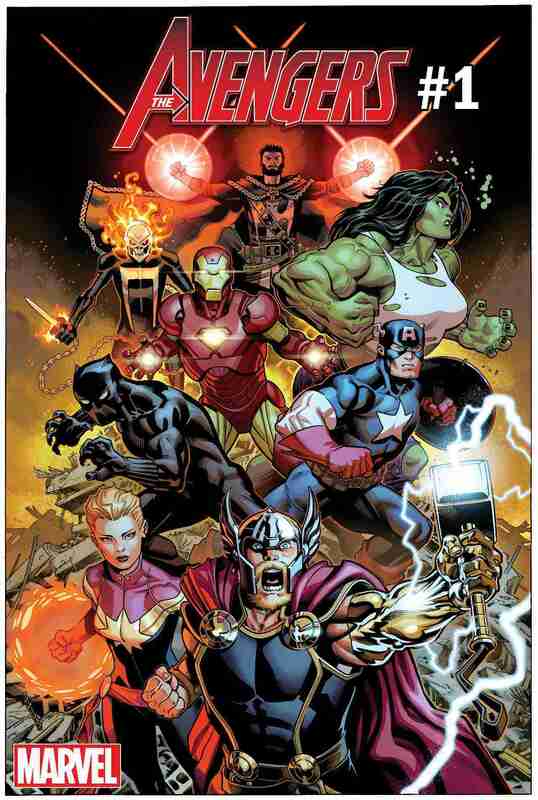 Marvel Comics has revealed the new creative team and hero roster for the upcoming relaunch of Avengers. Avengers will be the only Avengers title in Marvel’s “Fresh Start” lineup. Avengers will ship 18 issues a year, replacing the multiple-series franchise of titles that included books like New Avengers, Secret Avengers, and Uncanny Avengers in the past. Avengers #1 reflects this status quo within the universe. After the events of Avengers: No Surrender, the three Avengers teams that joined forces in that consolidated single series are pared down to the point that there are practically no Avengers left. This leaves a vacuum for this new Avengers team form. The series will have a similar format to Aaron’s Thor: God of Thunder series, shifting back and forth between present day events with the current Avengers team and the story of the prehistoric Avengers of 10,000 BC. That team was introduced by Aaron in the Marvel Legacy one-shot and included the first Black Panther, Ghost Rider, Odin, the Phoenix, Starbrand, Iron Fist, and Agamotto. The threat introduced in the Marvel Legacy one-shot, the enormous Dark Celestials, will tie the two stories together. Avengers #1 launches in May.